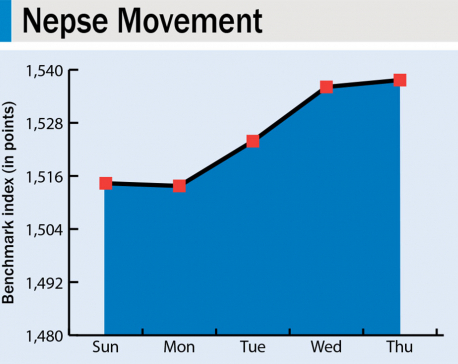 KATHMANDU, Jan 14: Nepal Stock Exchange (Nepse) benchmark index rebounded 8.49 points this week to close at 1,440.29 points on Wednesday-the last trading day of the week. 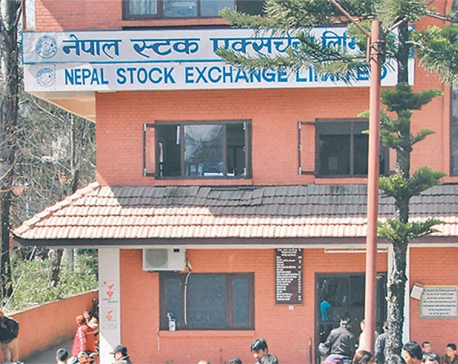 Due to public holiday on Thursday to mark National Unity Day, Nepse trading floor remained opened only for four days. Following a steep decline for few weeks, the stocks have recovered their value to some extents in last weeks. Earlier last week, the benchmark index had bounced back 33.25 points ending the losing streak of previous three weeks. The stock rally began from the first trading day and continued until the last trading day when the benchmark index observed a correction. Due to the landslide victory that left alliance garnered in the recently held elections of national parliament and provincial assemblies, stocks were in a freefall until few weeks ago. The stock market rout worsened further after interest rates of deposit and loan start to skyrocket amid acute shortage of lendable fund in the banking system. According to analysts, stocks have recovered in recent days as many investors have found it an opportune moment to get hold of shares whose value have plunged heavily in last few weeks. They, however, say that the direction of the stocks largely depends on the liquidity position of bank and interest rates. Most of the trading groups went up in the week. Hotels group was the highest gainer with its sub-index climbing up 22.55 points to end at 2,152.57 points. Banking, the heavyweight group, also rose 11.19 points and closed at 1,244.95 points. Development Bank group ended 9.51 points higher at 1,614.82 points. Finance group logged a gain of 3.86 points to settle at 735.74 points. 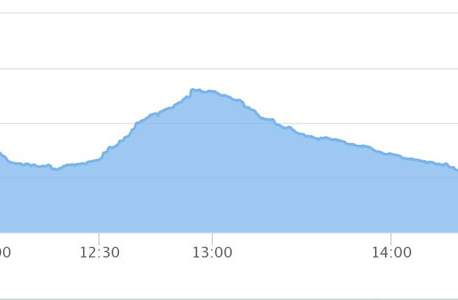 Sub-indices of Hydropower and Trading groups inched up 1.16 points and 1.69 points, respectively, closing at 1,921.11 points and 192.4 points. Insurance, however, suffered a loss of 13.38 points to finish at 7,457.63 points. Manufacturing and processing group shed 28.2 points to close at 2,506.8 points. Microfinance group also fell 3.17 points to close at 1,741.97 points. Bonus shares of Ngadi Power Group Limited, Sanima Bank Ltd, Nabil Bank Ltd and Tourism Bank Ltd were listed in Nepse for the trading. Similarly, rights shares of Excel Development Bank Ltd also got listed for the trading in the secondary market. 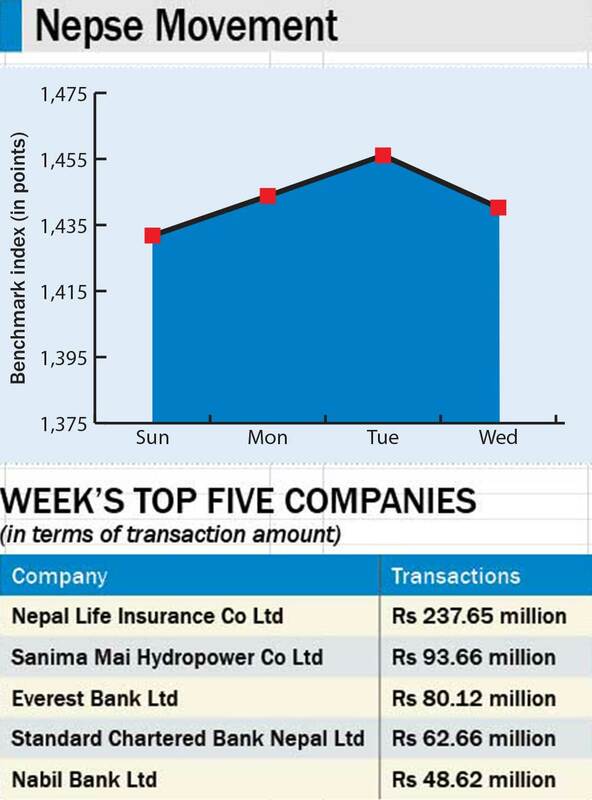 Nepal Life Insurance Company Ltd topped the list of companies in terms of turnover (Rs 237.6 million), traded shares (199,000 units) and number of transactions (1,475). A total of 4.1 million units shares of 174 companies worth Rs 1.71 billion were traded in the market this week through 17,393 transactions. The turnover is 36.79 percent lower than that of the last week.